And then we tested the CPUs with 7-Zip. 7-Zip is a popular opensource benchmark which stresses on CPU cores and memory. The results for 7-zip is a mixed bag. 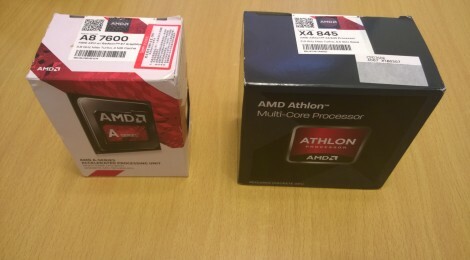 I have carried out several test to confirm that Athlon x4 845 was faster for decompression but slower in compression. x264 HD Benchmark encodes a 1080p video clip into a high quality x264 video file. There was a modest gain in the newer architecture. Without the power-consuming iGPU, Athlonx4 845 can be 10% faster than the A8-7600 while still in the 65W TDP.